In 2010, the Montana Environmental Custodial Trust began demolition of the former ASARCO residences on South Montana Avenue (East Helena) as part of its long-term planning, cleanup and restoration of the former ASARCO smelter property in East Helena. The demolition concluded a 10-month effort that involved: assisting former ASARCO tenants with relocating to alternate homes; performing cultural resource surveys, studies and recordation under the National Historic Preservation Act; and cleaning, securing and abating asbestos in the residences. A total of seven residences on South Montana Avenue and two farmsteads (the Merritt-Dartman Farmstead and the Vollmer Ranch) were demolished. Prior to razing the structures, EPA and the Custodial Trust recycled everything with reuse value in the houses, including fixtures, cabinets, appliances and other building materials, and donated the salvaged resources to local non‐profits—Habitat for Humanity and the Florence Crittenden Foundation. The Custodial Trust elected to preserve the former ASARCO smelter manager’s home (photo) in hopes that a local agency or non-profit could fund restoration and management for community use. 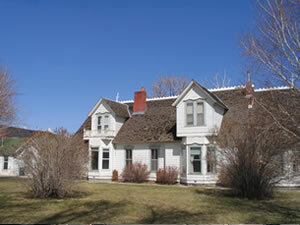 The Custodial Trust’s historic cultural heritage research concluded that the former manager’s house was eligible for listing on the National Register of Historic Places. Built in 1888, the landmark had historic significance for the city and state. The Custodial Trust began planning to relocate the house away from Prickly Pear Creek to implement the cleanup.